This article contains spoilers for the ending of Jurassic World: Fallen Kingdom. Jurassic World: Fallen Kingdom hinges on an ethical question: If you lived in a world where dinosaurs were resurrected but were about to go extinct again, would you save them? 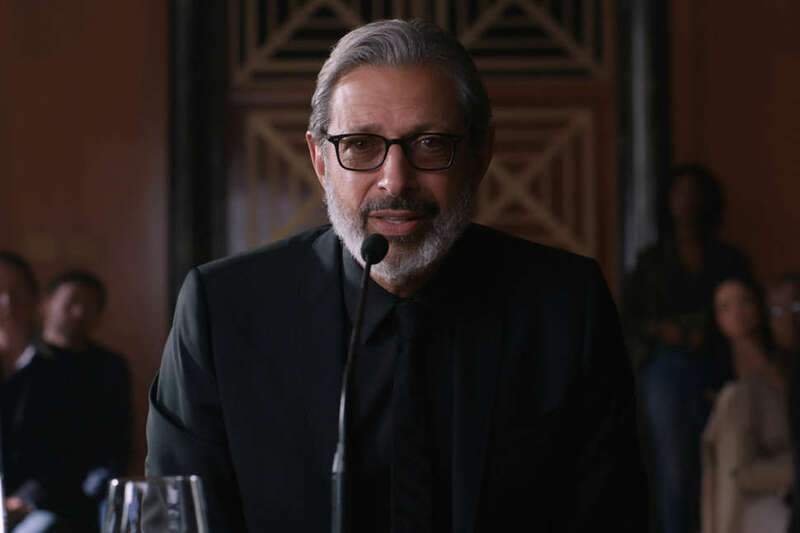 If you're Jeff Goldblum's Dr. Ian Malcolm, the answer is: "No! Are you nuts?" But if you're, say, Bryce Dallas Howard's Claire Dearing, it's a little more complicated. Since we last saw her, Claire has become a dino advocate in the wake of a volcano threatening Isla Nublar, and it's an effort to help the creatures that sets off the disaster that inevitably unfolds in Fallen Kingdom. Of course, we as audience members know: There's no way the last living dinosaurs are going to bite the dust. There's a franchise to consider. So, indeed, the movie ends in full on crisis-mode. But it does present an intriguing "what if" scenario before it gets to that point. First off, some of the prehistoric stompers do get off Isla Nublar, the famed site of innumerable fatalities at this point. That's because Claire and Owen (Chris Pratt) unwittingly help a bunch of mercenaries capture them. Our heroes think they're sending them to a sanctuary, but really, they are mere pawns in a larger plot to sell dinos for boatloads of money. After making it to America, the ancient giants are housed in an underground facility at the stately manor owned by Benjamin Lockwood (James Cromwell), the aged patrician who apparently founded Jurassic Park with John Hammond (Richard Attenborough). The smarmy Eli Mills (Rafe Spall), who is in charge of Lockwood's estate, has used the old man's name and his facility for his dastardly plan. After heartless rich people from around the world bid on the beasts as if they were toys, chaos unfolds involving the hybrid monster called the Indoraptor, which gets loose thanks to some hubristic human involvement. (Best not to try to extract a tooth from a violent weaponized being.) As it rampages and almost eats our heroes, the systems in the manor fail. This puts the rest of the animals in peril and at risk of suffocation. Franklin and Zia -- a tech guy and veterinarian, respectively played by Justice Smith and Daniella Pineda -- work to save them, but at the end, it seems too late. The only solution would be to let the dinos go free, and even Claire realizes that would probably be a bad call. Thus, she resigns herself to letting them all die. It's a credit to director J.A. Bayona that this evokes any emotional response among the audience, but his image of the trapped herd is stirring. For the moment you think they are all about to face second extinction, it's bittersweet. However, at the last second little Maisie Lockwood -- the granddaughter of Benjamin and a clone herself -- releases the horde. Her reasoning: They deserve to live just like she does. But at what cost? Let's just assume probably a big one because dinos are running free across America. The T. rex bounds into the forest. A pack of Pteranodons fly as Claire and Owen drive. Blue, the raptor raised by Owen, peers over a suburban town, ready to wreak havoc. And, in a post credits tag, Vegas gets some particularly nasty winged visitors. The already announced third film in the World section of the Jurassic series is due out in 2021. Colin Trevorrow -- who directed the first Jurassic World and co-wrote Fallen Kingdom -- will be taking over for Bayona to make what, he told UPROXX, is "a movie I've wanted to see my whole life." He noted in a separate interview with Entertainment Weekly that he'd describe what he has in mind as a "science thriller," in line with the very first Spielberg film. How that aligns with dinosaurs ripping up cities is anyone's guess. All we can speculate is that a lot of clean-up is going to be necessary.